Politics, Cricket and Cinema are three cardinal subjects which are closely followed in India. Political dramas are not new in our industry and there are several movies made till date. “Sangharsh Yatra” is a fictional story of a grass root leader which emerges from central part of Maharashtra and makes a paradigm shift in politics. He is dynamic and slowly unfolds his vision for Maharashtra. It is the aura of his leadership which ultimately makes him an endless legend. The story starts with Sainath Sankhe (Sharad Kelkar) meeting a fatal accident. Flashback takes us to the time when Sainath was a young boy who had the urge to help others and participate in social work. He never left an opportunity to support needy people. Every person he interacts with, predicts that one day he will achieve something big in life. Sainath meets a visionary leader Pratik Sarang (Omkar Karve) who immediately reads the potential in Sainath and invites him to join active politics with a national party. Very soon, Sainath turns into an astute politician and attracts masses with his fiery speeches and style of working. Sainath gets married to Ratna (Deepti Bhagwat) who is the younger sister of Pratik Sarang. They have three daughters, Sampada (Shruti Marathe), Nilam (Preetam Kangne) & Reshu. Fame and position come at a cost. Will Sainath be in a position to sustain his leadership stardom? Are there any unseen roadblocks with will ruin his ideas of helping and uplifting the poor? Most importantly, will he be in a position to give quality time to his family? Sharad Kelkar comes out as a strong actor in his role as a politician. He delivers the dialogue “Me Kadhich Velevar Pohchat Nahi” with a commanding voice. Omkar Karve is good and convincing as a leader. Shruti Marathe hardly has any screen presence and probably is the most talented artist, who is largely underutilized. 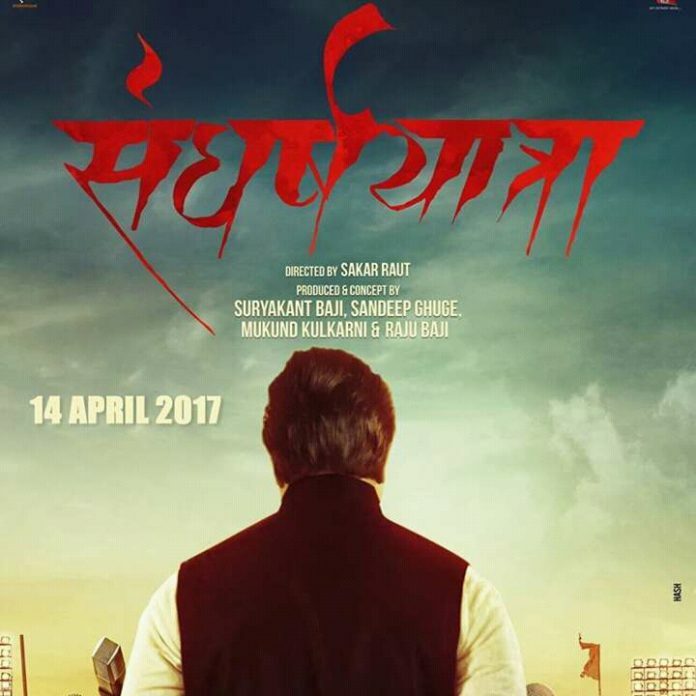 Director Sakar Raut tries to show us the journey of Sainath, however, the film gets imbalanced at multiple points and also the ordering of sequences goes for a toss. “Sangharsh Yatra” has a powada sung by Adarsh Shinde and Aniruddha Joshi and lyrics are penned by Shahir Meshram. The song “Tu Chal Pudhe” is sung by Amruta Fadnavis and is perfectly placed in the movie. The positive side of this film is probably the canny dialogues from Sharad Kelkar like “Lokanchi manne modnya peksha, sabda modlela kay vait”. It will be prudent to conclude that there is little attention paid to the relative importance of various sequences, disposition of crisis and how it will affect the overall movie. Screen time of 90 minutes is just not enough to justify the perilous journey of a leader. Also, when one still persists on connecting those dots, what comes out is a weak film.